I received this email from a reader, Cameron Watkins, Thursday and it proved I was correct to learn recently how to operate email. Enough with Derrick Rose for a few days; he really is doing well, by the way. It’s a familiar lament of overprotective fans regarding Rose and today’s fragile–or so they must think–professional athletes. But it’s also an appropriate reminiscence of the man many still believe to be the greatest to play the game, Chamberlain, who would have turned 78 Thursday. Chamberlain was so unstoppable the NBA widened the lane from 12 feet to the current 16 feet in 1964 in an attempt to counter Wilt by getting him farther from the basket. Chamberlain died of a heart attack Oct. 12, 1999 and is known more in basketball myth as sort of the pre-Shaq, the most dominant who scored 100 points in an NBA game, one of sports’ records considered unbreakable. I asked Michael Jordan about it the season he scored his career most, 69 points against the Cleveland Cavaliers in an overtime game. Though in that 1961-62 season, Wilt was so dominant and scoring so regularly–and, remember, he was playing against all time greats like Bill Russell, Walt Bellamy, Bob Pettit, Oscar Robertson, Elgin Baylor and Jerry West–that as amazing as it seems, scoring 100 points was not that unexpected. Wilt had scored at least 60 points in four of the previous five games. When Russell was informed of the feat done in sporting anonymity in Hershey, Pa., Russell smiled like it was merely expected and just said that, well, the big guy did get to 100 points. Chamberlain was so unstoppable the NBA widened the lane from 12 feet to the current 16 feet in 1964 in an attempt to counter Wilt by getting him farther from the basket. It’s the only rules change in the modern era (shot clock starting in 1954) basically attributed to one player. The lane previously was widened from six to 12 feet in 1951 to help counter the dominance of George Mikan. But Wilt was more than just a scorer, says Walker. “He never really got with a true team until he came to play with us (the 76ers in 1965),” says Walker. “Now he had good players and didn’t have to score all the time, like he also did with the Lakers (when Chamberlain won his two titles and had a pair of seventh game Finals losses). Wilt was a complete player, except for shooting the free throws. But he made them when they counted. I remember a game in Detroit that ended tied with Wilt fouled. We all went to the locker room because we knew he would make them. And he did. Jordan is generally recognized as the game’s greatest player. But that’s not just for basketball, but his influence on society in his time. It’s likely no one will ever duplicate that. But for towering figures in the game, there may never be anyone like Wilt. Because part of his charm and impact–and likely much of the criticism–was his combative nature, his insecurities and his conflicting desires to be accepted and to stand out. One of the great joys being on the NBA beat for many years was to be able to spend time with Wilt, who never withheld an opinion and owned many. Rarely did he harbor an unexpressed thought. I caught up with him once during the Bulls’ record breaking 72-win season in 1996. Wilt thought he could help that Bulls team. After all he was only about to turn 60. 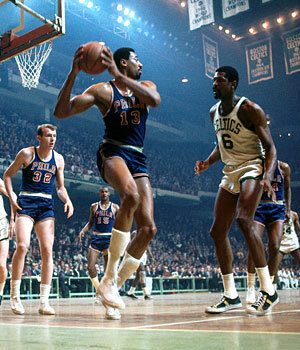 Wilt talked a lot and generally backed it up. The Bulls had a few flirtations with Wilt in the 1970’s, trying to draw him out of retirement before they claimed Artis Gilmore in the expansion draft. Chicago Blackhawks writer Bob Verdi also told an interesting tale last year of the time the Blackhawks supposedly considered trading disgruntled star Bobby Hull for Wilt, who then was with the Lakers. The Lakers owner also owned the hockey team. Which brings me back to the email. And thus to Derrick Rose. No, we can’t stay away from him. Players have to play; it’s not only their jobs, but it’s their passion and who they are. There always are changes in society. One curious change in sports is the developing notion that somehow if players do not play as much, they’ll remain healthier. I don’t know the statistics, but it seems to me there are more injuries now–sore arms in baseball, knees in basketball—than ever before. Not that he misses many games, but LeBron James, probably the strongest figure in the game, never in his career has played in all 82 games. And he’s basically never been hurt. Wilt’s feats, obviously, were prodigious. With overtime games, he once averaged 48.5 minutes per game in a season. Even in his final season in 1972-73 at 36, he averaged 43.2 minutes per game. Tiny Archibald led the league at 46 then. But a look at the minutes leaders through the 1960’s and 1970’s shows the top 10 essentially all averaging at least 40 minutes per game. Basically, no one does anymore. There’s this tendency in this era to treat athletes like breakable porcelain. Obviously, a big part of that is the finances. That’s right. They weren’t paid that much then, so who cared, eh? There’s really no evidence that not playing prevents injuries. Well, not playing at all, of course, is the safest method to remain healthy. Not leaving your house probably helps as well. 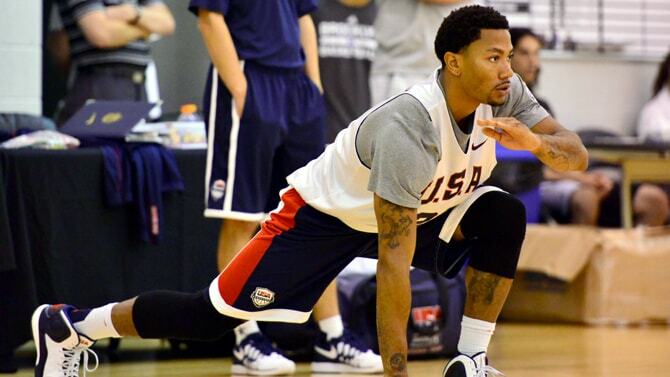 Derrick Rose may get hurt again. It would be unfortunate, but so can anyone else. Sure, medically he probably is more vulnerable because he was hurt and had surgery. But he’s a player and he has to play. Which is why the best thing for him now is to be playing for USA Basketball. If Rose is going to be effective for the Bulls this season and in his career, he needs to begin playing regularly against high level competition in true game settings. If USA Basketball decides they want to choose someone else for its team, that’s another issue. It’s their choice. But Rose is correct to be involved. As well as everyone else, he needs to find out where he is as a player and begin that journey back. You cannot do so on weights machines. If there were really anything wrong with his knee now, why exactly would the Bulls be allowing him to play and coach Tom Thibodeau, a USA Basketball assistant with Rose regularly, be supporting that decision? Of course, they would not be. Players played. That’s the great history of the game. When Rose was hurt last season, he was averaging about 31 minutes per game and hadn’t played 35 minutes in any game. Paul George hardly had played at all before his unfortunate injury at USA camp earlier this month. It happens. But every pro knows you are most at risk when you are being the most cautious. And you don’t become a great player by not playing. The greatest in history didn’t rest. Jordan in his last season at age 40 played all 82 games and averaged 37 minutes per game. Jordan didn’t miss a game in the Bulls 1996-98 title seasons and averaged more than 38 minutes per game after turning 33 in those years. Wilt didn’t miss a game his last three years in the NBA. We’re grateful Wilt chose to be a player. It’s another reason there hardly was anyone ever like him. Rose, by the way, told reporters in New York Thursday after USA practice that he feels fine and merely took off Wednesday to better pace himself, and well, without trying to offend anyone, the USA team was favored by 40 points. There are risks in life and basketball. But the joy always is in the game. I’m sure Wilt would have told him, “Kid, you’ve got to play.” Probably after challenging him to a one-on-one game. And a long toss contest, a game of pool, some golf and tennis. And while he was 78 Thursday. We miss the guys like Wilt.